A great look at Chicago in the first decade of the twentieth century can be found in a V. O Hammon postcard entitled A Busy Day on Dearborn and Randolph Streets Chicago. The scene depicted is chaotic with horse-drawn beer wagons, ice wagons, and general produce of all sorts competing with a long string of trolley cars moving into the intersection and down Dearborn Street. Dozens of people wait at all four corners, looking for a chance to cross the impossibly busy street without being maimed. An interesting detail can be found on the most prominent building in the photo. The Cunard Line has offices on the ground floor, and a real estate firm, Koester and Zander, has its name on the floor above. That’s the point where little details like these lead toward surprising discoveries. Cunard’s Mauritania and Lusitania had only been in trans-Atlantic service for five years when this postcard was mailed. The Lusitania would sail for three more years before being torpedoed off Ireland by a German U-boat. More interesting to me, though, is the real estate office of Koester and Zander, located then at 69 Dearborn Street. Henry George Zander was born in Rendsburg, Schlewign-Hostein, Germany in 1869. He began his education in Germany but finished in Chicago, graduating in 1886 from North Division High School, what is now Lincoln Park High School. He trained as a civil engineer before obtaining his law degree from John Marshall Law School. He formed the partnership with G. F. Koester, and Koester and Zander got about the business of running a general real estate and loan business. George Frederick Koester was born in Chicago in 1862, so he was younger than Zander by seven years. He was educated in the public schools and attended the brand new West Division High School until 1878. Since the new high school only housed freshmen and sophomores, it is likely that Koster’s formative education ended at the end of the tenth grade. After he left school he worked for the German Book and News Co., the Western Union Telegraph Co., the National Livestock Journal, and then for the grocery company of Scherer, Shirk & Co. Somewhere around 1891 he began dealing in real estate and hooked up with Zander in 1892. Their biographies give little explanation for how the two met or what sustained their relationship. They seem to have had little in common. Zander lived in Irving Park; Koester in Ravenswood. Zander belonged to the Irving Park Country Club and the Irving Golf Club while Koester played his golf at the Ravenswood Golf Club. Both men were 32º Masons, which might explain the connection. In any event, their partnership led to the development of an entire section of Chicago when in 1912 the firm purchased 212 acres in Jefferson Township -- what is now the Sauganash neighborhood. It's a secluded community roughly bounded by Devon Avenue on the north, Bryn Mawr on the south, Cicero on the west and the old Chicago and North Western tracks on the east. The community was named after the Potawatomi Indian chief, who was actually born part Mohawk, the son of an Irishman who was serving as a British Army captain in Canada and a Mohawk woman. Taking his father’s name, Billy Caldwell moved between the world of the white man and the natives, never quite making a place in either population. Caldwell settled in Chicago around 1803 working with the Kinzie family in their fur trade while helping to smooth relations between the British, the United States and various native tribes. His services were so useful that the United States government rewarded him with the first frame house to be built in the city. It was located approximately where Holy Name Cathedral stands today. Along with this Caldwell received 1,600 acres of land along the Chicago River where the present day Sauganash neighborhood is located. In 1829 Caldwell was made a Potawatomi Chief and given the name Sauganash, or “Englsihman” in the native tongue. His appointment was beneficial to the government . . . he understood the language and had been helpful in making treaties and settling disputes for some time. The natives also saw this as a good move, assuming that his leadership would be beneficial to them in negotiations with the government. In 1835 the federal government forced the Potawatomi to give up five million acres of land and move east of the Mississippi River. 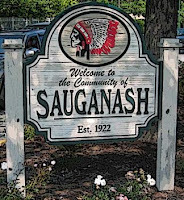 Chief Sauganash accepted the government’s terms for the tribe. 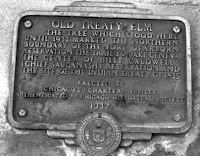 On September 26, 1835 a treaty was signed under the “Treaty Elm,” after which the Chief, his family and 3,000 Potawatomi headed for Council Bluffs, Iowa. 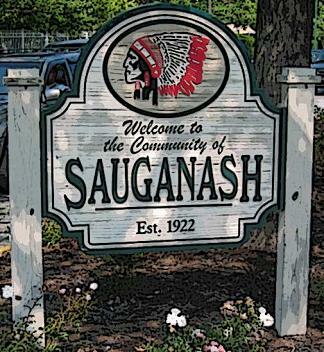 Sauganash died there on September 28, 1841. Great post. It's hard to believe that Randolph and Dearborn used to look like that! Thank you for your detailed history on Chicago and Koester and Zander. My interest goes deep since George F. Koester is my 2nd Great Grandfather. I have just discovered more about him and your article. I would love to know more and see photos or other details. Thank you very much! So awesome to see this! And your history is just great. I have relatives that moved from Sweden in the 1920s and love to see the background of the ciy. Thanks so much! So glad to have found this info. About 20 years ago I stumbled onto an 8 1/2 black and white photo of this scene. Wasn’t able to identify then. Today I merely googled “Koester & Zander” and found your post!! Thank you!